How much have you thought about the legacy you’ll leave behind? Some people lovingly plan their estates, poring over details, involving family members, and making sure everyone knows what to expect. It’s much more common, though, to avoid the subject, tending only to the basics—your will, a little tax planning. If you do that, however, you never really come to grips with questions of not only what you’ll bequeath to whom, but also how you want to be remembered, and what life lessons you’d like to pass along to your loved ones. Today’s inheritances are like any other. It’s really not. The size of the current transfer—some estimates are that $25 trillion may be passed along in coming decades—dwarfs what has come before, and today’s families are more complex, with divorce, remarriage, and geographical dispersion. This clouds what, in simpler times, were more straightforward lines of inheritance. Further complicating things are the sometimes still-rocky relationships between baby boomer children of the 1960s and their parents. And finally, increased longevity means that inheritances may be received by those who are themselves far from young. Inheritance is the name of the game. “Inheritance” may have largely negative connotations for elders and baby boomers, often evoking anxiety, fear, and resentment about what tends to be seen as strictly financial. Meanwhile, the term “legacy” is considered much broader and less threatening, as much an opportunity as an obligation. Even those who are passing along a small fortune often prefer to focus on their non-financial bequests—of stories, memories, mementos, and values. Legacy, according to the study, stands on four pillars: values and life lessons; instructions and wishes; personal possessions of emotional value; and, finally, financial assets or real estate. Money is the most important legacy. That’s not true, it turns out, for those on the giving or the receiving end. The baby boomers have a longstanding reputation as the “me” generation, and many elders may fear their children will discount any inheritance that can’t be listed on a financial statement. But when asked to rank the “four pillars” in descending order of importance, financial assets came in a distant fourth among boomers, after values (most important), instructions, and personal possessions. Elders ranked the pillars in largely the same order, though they put financial assets just ahead of personal possessions. Families talk about their legacy plans. Family discussions about the issues of inheritance and legacy tend to bring family members closer and can defuse a host of potential issues. A family might work out a system for dividing prized possessions, for example, perhaps giving everyone credits to “spend.” And knowing how much money to expect could help potential inheritors plan their own finances accordingly. Yet despite obvious benefits, family conversations about legacy matters seldom take place. Boomers, in particular, are often reluctant to discuss inheritance and death. All children are equal. Most boomers do expect to share an inheritance equally with siblings, and may be unhappy if that’s not what happens. 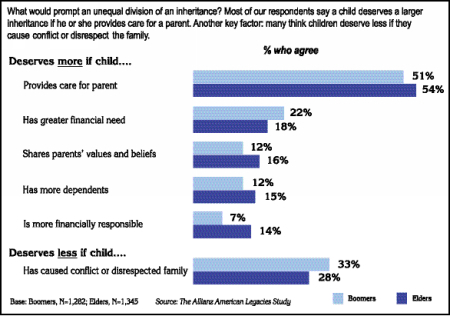 But a third of the parents in the Allianz study said they consider decisions about how much each child should receive to be an important source of their power and control, and many feel it’s their prerogative to disinherit a child or distribute assets unequally. Bad deeds—causing family conflicts or showing a lack of respect—may not go unpunished, while children who provide care for parents or have greater financial need could well get more than their siblings receive. Families want only financial advice when planning their legacies. Given that financial interests are seldom the top priorities of either elders or baby boomers, it’s hardly surprising that when seeking advice, people put as high a value on honesty, clarity, and listening skills as they do on minimizing taxes or maximizing the long-term value of an inheritance. Working with you and your attorney, we can help you to craft or update a holistic estate plan that considers all of your desires and addresses these deeply personal issues.